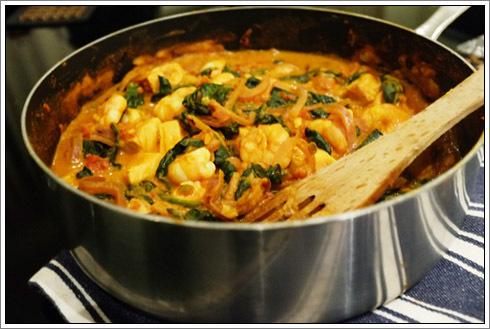 A deliciously quick and easy curry for a week night, and it's healthy too! I have been craving curry for ages, but had been holding off due to my bank balance still reeling slightly from the Christmas season. In the end I decided to make my own using what I had available in the fridge, and this was the result. The yogurt adds a lovely tang, but if you want something a little richer, try using coconut milk instead. I like my curries pretty hot, though with two chillis this was mild (I suspect supermarket chillis have the heat bred out of them), however if you're worried or simply not a fan of heat, just add one. You can always add a pinch of dried chillis mid-way through cooking if it tastes too mild. Heat the oil in a frying pan over a low heat then add the onion, turmeric, cumin and coriander and cook for 10 minutes until softened. Peel the ginger and then finely chop this and the garlic. Deseed and finely chop the chilli. Add to the onion and fry for 2-3 minutes. Add the chopped tomatoes and simmer for 10 minutes. While the sauce is simmering, skin the salmon fillets and cut into chunks. Next, add the spinach to the sauce and let it wilt down. Add the salmon and prawns and cook for 2-3 minutes, until the prawns turn pink. Finally, stir through the yogurt and then serve with basmati rice or my personal favourite, niramish (recipe to follow soon).